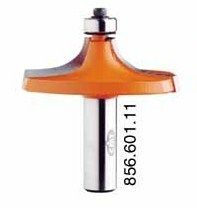 Your investment will be well repaid with the variety of decorative profiles you can achieve with these CMT Table Edge and Hand Rail Bits. Our table edge bits give perfectly smooth well-proportioned curves to dining and coffee table edges. CMT Hand Rail bits with a 30� bevel edge and a 1/8� bead let you make beautiful and functional hand rails that add an understated touch of class to any architectural setting. Safety tips: These wide profile bits remove large amounts of material when cutting and create a great quantity of saw dust. We suggest using a vacuum on your router table to make the job easier and keep the work area safe.